Have you ever had a day a week when you had plenty of food in the fridge and no reason not cook but you still didn't want to? Well, you are a lot more determined and talented than I am because that was my week. Or at least a good portion of it. I just DID NOT want to cook!!! I think, I probably made two things from our planned menu. Surprisingly, we only ate out once (the day we did our taxes) to celebrate and because it took us way longer to finish them, and the kids were starving. Your recipe sounds delicious, Cindy! I definitely need to make it! I never feel like cooking. It is a big effort to get over this every time so I can really relate to your mood this week. As you probably know, buttermilk freezes well. That is totally how my week has started. :) it is okay - we all have those weeks. For the buttermilk, you can freeze it in ice cube trays and then pop them in a freezer bag when you cannot use it all...because really who can! Get ahold of some buttermilk powder next time. It keeps forever and will avoid the food waste issue. Ugh, it makes me queasy to read about it. The stuff is NASTY! I have had weeks like you have had....more often than I would like to admit. Have you tried making your own buttermilk with milk and vinegar. I never buy buttermilk because I can't stand it, but when a recipe calls for it I make my own since it is usually only 1/2 cup or less. By the way, your meal plan this week sounds great! My mouth is now watering for meatballs- haha! You know... I'm right there with you on the buttermilk. I dont even like milk, and the only milk I use in cooking is evaporated milk. I had found this recipe I was dying to make, which was a spinach lasagna thingy, and it required buttermilk. The smaller containers were way too big for my needs, so I googled an alternative, and people said to use cream (half and half), and it worked like a charm. Cream can be obtained in much, much smaller packages, and even then, I think I had to throw away some of the cream because it's not something I use... still, a lot less than what I would've had to throw away had I used buttermilk. I'll never know of the flavor difference, but it worked for me! Huh, it's good to know! I don't think, cream would work for my recipe but it's nice to know next time I'll make spinach lasagna. I think cooking has alot to do with what we feel like making! If my heart isn't in it, it doesn't turn out. My kids used to say I didn't "make it with love". Stir, and watch it thicken. TIP: ***** This is good for cooking/baking. If you are a buttermilk drinker, you will not like this taste. 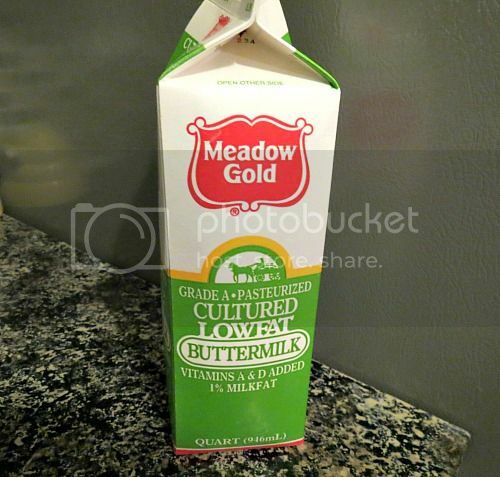 You should buy buttermilk at the store. Let's just blame this on February, that is what I am going to do with all of my problems right now. It is the fault of February. For the chicken meal we had tonight we forgot the sesame seeds and I forgot to add a cornstarch/water mixture to thicken it up, but it was still good. I didn't buy strawberry preserves as I wasn't sure if it just meant strawberry jam. It was still very good, but I think having something to dip it in would have been nice. For the Monday meal we forgot all about the salad until we were finished. I am liking it so far. We are done dinner so much earlier! Not sure yet if I will pay to continually receive recipe's or if we'll just figure it out on our own, we will see. I wonder if this powdered buttermilk would work.